This year, for the first time in my life, I brought home a Christmas tree without the help of an internal combustion engine. That’s right, I schlepped a six-foot Douglas fir for a block and a half, arms sore, hands sticky with pungent sap. 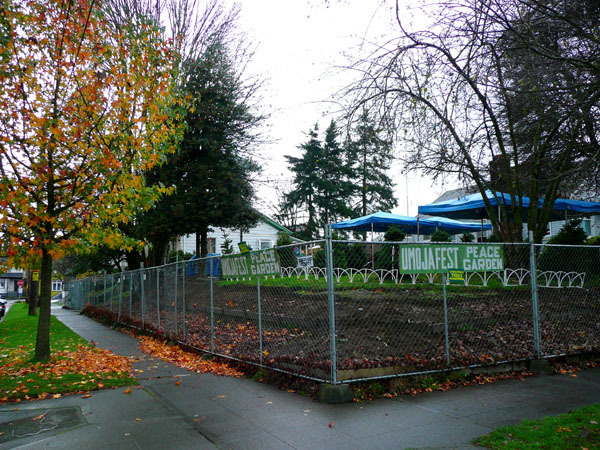 For years the two neglected houses behind the chain link fence on the corner of 24th and Spring in the Central District (photo above) seemed to be inhabited solely by middled-aged African American men who did nothing but play horseshoes in the front yard all day. I used to catch myself envying their laid back lifestyle as I rode by on perfect Seattle summer evenings on my way home after a long day of work. 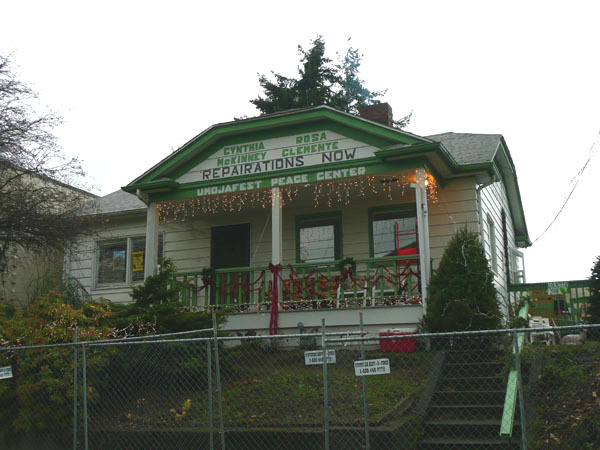 A few months ago the site was suddenly cleaned up and transformed into the local campaign headquarters for Green Party presidential ticket Cynthia McKinney and Rosa Clemente. And then two weeks ago the Christmas trees showed up. I asked the guy selling the trees what else was going on, and he described how they were setting up services to help keep teens off the streets, and he had a lot to say about how this was what they had wanted to be part of the Northwest African American Museum, and also how he grew up a block away on 23rd Ave and how his father was one of the first successful black businessmen in Seattle, and so on. As we were leaving with the tree he handed me a photocopy of an October 2008 Seattle Metropolitan feature on the museum (9 MB pdf). Turns out our tree salesman was Omari Tahir-Garrett, one of the activists who occupied Colman School from 1985 to 1993 to pressure the City to create a black culture center there. Sadly, Garrett is probably more well known for smashing Mayor Paul Schell in the face with a megaphone during a public event in 2001 at 23rd and Union, where a month earlier a black man had been shot and killed by police. That’s life in the Big City. And the Big City has history. All the power to Garrett and his cohorts for their resourceful commitment to helping keep neighborhood teens out of trouble. The property owner, who owns the entire post office block, is letting them use the site until the whole thing is redeveloped, presumably during the next development upturn. And so we got our car-free Christmas tree. And we avoided the stress of traffic and parking, chatted with neighbors along the way, supported a good local cause, and learned some things about our community, both past and present. This is how urban life should be. And walkability is the essential catalyst. Posted by dan bertolet on	Wednesday, December 10th, 2008 at 12:42 am. You can follow any responses to this entry through the RSS 2.0 feed. You can leave a response, or trackback from your own site. « It’s Almost Painful To Witness The Seattle Times Editorial Board Continue To Flounder Towards Total Irrelevance. Almost. Wow. Who let that liquidambar tree get planted in the treelawn in the ROW? Geez. I hope that’s off the species list now. But anyway, I like it. More of these endeavors please. I’m trying to think how we used to move large objects – like xmas trees – back before everyone had a car. The answer, of course, was delivery. The xmas tree lot would have recruited little Jimmy from down the block to deliver trees to customers for tips. Hey look, a new green job. You’ve been lecturing for how long against motor vehicles and for walkable density, and this is the FIRST year you’ve managed to carry off buying and bringing home a Christmas tree without driving? I need to wonder how many other of your advocacy issues you’ve yet to demonstrate by personal example. Some other spots for a car-free Christmas tree include the Seattle AIDS Support Group’s sale at Dunshee House, 17th and E Thomas, and the parking lot of Grocery Outlet on MLK (where the farmers market is in summer). I carried a SMALL tree home from Dunshee House, feeling very Christmas-in-the-city. In New York tiny tree lots spring up on random corners and sidewalks all over the city.